Daniel Radcliffe, 25, famous for playing Harry Potter, visited a cafe which specializes in the sale of marijuana, Joa Green House in Amsterdam (Netherlands). The actor posed for photos with the bar staff and the image was posted on the social network the house with the caption: "Say what ...". According to the site of the house, several celebrities have passed through there as Kevin Spacey, Miley Cyrus, Rihanna, Lil Wayne, Chris Brown, 50 Cent, Pierce Brosnan, Gwen Stefani and Alicia Keys, among others, many others. 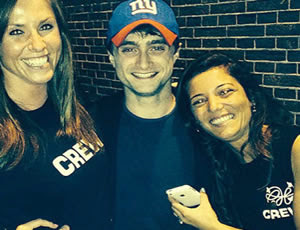 Radcliffe recently stop drinking 4 years ago when he realized that consumption had gotten out of control and said recorded scenes of the Harry Potter movies hangover.